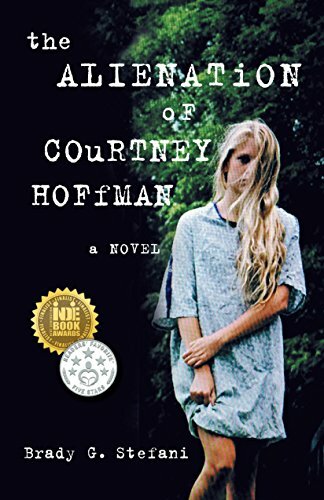 “The Alienation of Courtney Hoffman” by Brady G. Stefani is a captivating and gripping sci-fi adventure that is geared toward the young adult crowd, but sure to thrill readers of all ages. Courtney Hoffman wants nothing more than to be a normal fifteen-year-old, but there is no such thing as normal in Courtney’s world, and it keeps getting stranger by the day. It all started eight years earlier, when her grandfather marks her with a mysterious tattoo on her back, right before he tries to drown her in the bathtub. Add to that the voices and visions of aliens in her head that she fears are more than dreams, and Courtney thinks her mom may be right – maybe she does need to be locked up in a mental hospital. The aliens however, have a different view, as does her new friend Agatha, and Courtney soon finds herself working furiously to stop the impending doom before the forces against her succeed in their evil mission. I thoroughly enjoyed this story. The writing is excellent. Stefani drew me into the story within the first several pages and kept me engaged throughout, with a plot full of drama and suspense, supported by a well-developed world, and delivered with crisp detail. The setting in the monastery created another layer of fascination, and the setting in the abandoned mental hospital added a bit of horror and creepiness to the overall tone. I found the characters dynamic and magnetic. Courtney is a heroic protagonist and it was nice to see her develop and mature as the story progressed. All of the main characters stirred up different emotions in me. I was totally outraged by the shallow attitude and behavior of Courtney’s mother. Her unyielding beliefs and condescending tendencies really created feelings of genuine dislike for the woman. Ditto for her boyfriend, Dr. Anderson. Other characters are enigmatic and disturbing, and very relevant to this science-fiction story – it would scarcely qualify as a great sci-fi without aliens or a few mad scientists now, would it? "The Alienation of Courtney Hoffman" by Brady G. Stefani is an intriguing, fast-moving science-fiction adventure. It has the makings of a great series for young adults, but it is truly a gem for all ages.